A group of “pro-peace” activists gathered on Shelter Island Sunday afternoon (Aug.2) to welcome the Golden Rule, a sailboat described as “the very first of the environmental and peace vessels to go to sea,” which came to town in advance of the annual conference of the activist group Veterans for Peace, taking place August 5-9 in San Diego. says Gary Butterfield, local chairman for the convention. The boat first launched in 1958, sailing from the Los Angeles port of San Pedro toward Eniwetok Atoll, where the U.S. government was conducting above-ground nuclear weapons testing. 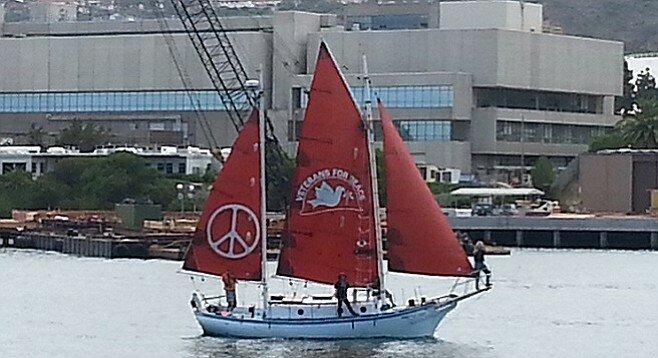 The crew of anti-nuclear activists never reached their destination, and the vessel was boarded by the Coast Guard off Hawaii, with the crew being tried and jailed on the island. But the action garnered international attention, and further protests led to the signing of the Limited Nuclear Test Ban Treaty of 1963. Veterans for Peace volunteers in the Eureka area spent the last five years restoring the vessel, which is now scheduled to spend the next decade sailing around the United States. The convention, meanwhile, kicks off Wednesday and is expected to be attended by several hundred members from around the country. Many events, including nightly film screenings exploring the costs and aftermath of war, are open to the public. Veteran investigative journalist Seymour Hersh, who exposed the My Lai Massacre in Vietnam during 1969, is set to deliver the keynote address. “The theme is peace and reconciliation in the Pacific,” says Butterfield.